(22 June, 2012) Presented by two awesome production companies, this mega public spectacle looks like a great night out in Greenwich, invoking the ancient origins of the Olympic Gods and the transcendent achievements of contemporary athletes. If you miss it in June, you can try to see it in August. You will feel the earth move and the sky explode as an eight metre high Prometheus rises from the ground and creates fire and humanity in defiance of the God Zeus. Prometheus Awakes, an exhilarating re-interpretation of the legendary Greek myth, premieres against the stunning backdrop of the beautiful seventeenth century Queen’s House in the grounds of the Royal Museums Greenwich, a world heritage site. Prometheus Awakes then moves to the historic town of Stockton, where the story unfolds beside the banks of the River Tees. 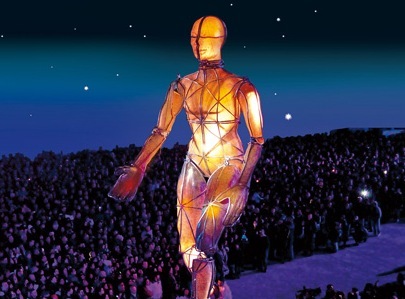 Created by Graeae, the boldly inventive disabled-led theatre company, in collaboration with Catalan masters of visual magnificence, La Fura dels Baus, Prometheus Awakes will inspire audiences with extraordinary stagecraft, giant puppets, mass choreography and special effects. Co-directed by Amit Sharma and Pera Tantiñá featuring large-scale digital projections by Simon McKeown, choreography by Darshan Singh Bhuller and original composition by Jules Maxwell, Prometheus Awakes will be the first ever large-scale outdoor theatre production in this country that is led by disabled artists. Disabled and non- disabled performers recruited from local boroughs and towns will take to the air in this thrilling piece of outdoor theatre as part of the main cast and as volunteers for an audience of thousands. Prometheus Awakes is part of the London 2012 Festival, a spectacular 12-week nationwide celebration from 21 June and running until 9 September 2012 bringing together leading artists from across the world with the very best from the UK. Prometheus Awakes is a free un-ticketed event.